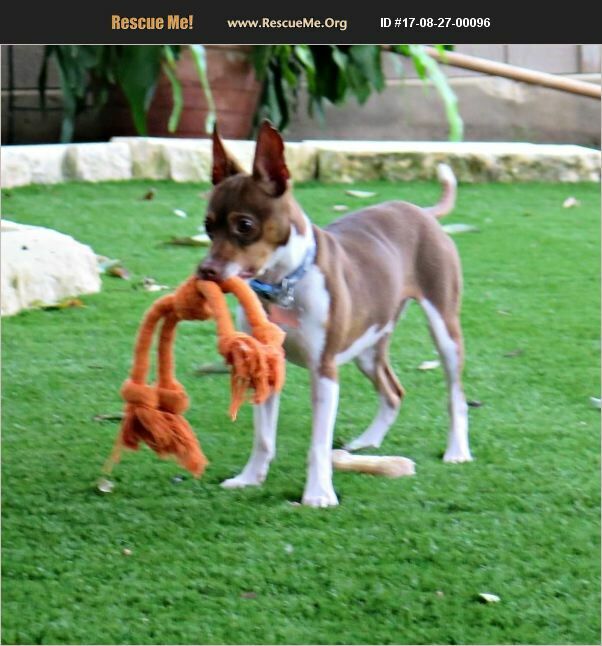 Lewis is a 3 year old weighing 16 pound Rat Terrier mix that has been with us for 1 year. He was brought to PPR by a foster that wanted help in getting Lewis vaccinated, microchipped and neutered. He was 11 pounds and obviously not in great shape. After being neutered, Lewis could not wake up easily and he was uncoordinated in all his movements. The foster surrendered his to our group to help him get better. We immediately took him to the vet and after many tests, he was diagnosed with a liver disease. We changed his diet and put him on medication and eventually, Lewis started to get better. He gained weight and his energy level began to improve. We have kept him on the diet and two inexpensive medications and he remains in good health. He is now a very healthy, active and fun loving dog. He runs and plays with all the dogs in the group for hours on end. When not playing, he will be outside in the sun, catching rays or on the backyard bench sleeping. He loves being the rabbit as the other dogs chase him around the backyard. He will even play fetch. He is very housebroken and is kennel trained (loves his kennel). He would be a good dog for older children and would definitely benefit from having a another dog around. Lewis is up to date on all vaccinations, heartworm negative, neutered and microchipped. He will need a special diet and a couple of medications for the rest of his life.